Monica Wright quietly became the University of Virginia’s all-time scorer tonight, in a loss to Maryland. She passed Dawn Staley in doing so – now that’s a feat. An NCAA proposal would limit club teams’ out-of-state members. And the Georgetown Hoyas are ranked in the top 25 this week for the first time in 17 years. Previous article$100 for courtside seats at a high school game? 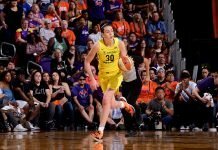 Next articleLynx to trade Sun for Whalen? Thanks for posting the link about the NCAA proposal…. 1) Why exactly do people think a high school student (from Anaheim) needs to be playing for a team from across the country (in Tennessee)? 2) What exactly are the "future challenges in the girls' game" that proponents describe? I had a feeling some type of regulation was coming, given the growth of the club game. 1. I wondered the same thing at the time. There are plenty of great club ball teams here in SoCal that get national attention. 2. Maybe they think girls will be lured by sponsors like the male players. Anonymous, if you want to re-post and include your name, I can run your comment.